Mounting voices in the Likud party are pressuring Israeli Prime Minister Benjamin Netanyahu to step down, arguing that the graft scandal he is embroiled in may stain the reputation of the party. Netanyahu’s political life is again on the line for a second time. The Israeli leader is accused by a former aid, Ari Harow, of taking gifts and bribes. Harrow himself is accused by Police of using his government position to advance his business interests. Police have not requested indictment of Netanyahu yet but voices from within his own party are coming more vocal regarding his resignation, including member of the Likud Central Committee, Gail Shmueli. “Likud follows the principle of obedience. We do not let any leader down, but the problem is that today we have reached a moral low and there is a leadership that has morally flawed and can no longer continue,” he said. A poll by local Channel 10 found that 66 percent of Israelis believe Netanyahu should resign if indicted, Times of Israel reports. However, the man who has been ruling Israel for more than a decade ruled out his resignation. Shmueli is worried that the series of scandals hitting the party may be the darkest years of the ruling Likud. “We are going through one of the darkest periods in the Likud’s history, if not the darkest one. If Bibi proves his innocence, we will all stand behind him,” he said. 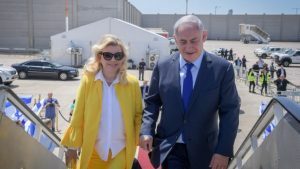 Netanyahu, and also his wife and son are involved in another graft case. Written by: KanelkaTagba on August 9, 2017. Posted by KanelkaTagba on Aug 9 2017. Filed under Headlines, World News. You can follow any responses to this entry through the RSS 2.0. Both comments and pings are currently closed.